» Home » Past Events » Salsa Night and Solidarity Lunch! 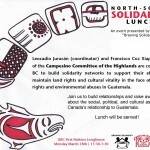 Salsa Night and Solidarity Lunch! 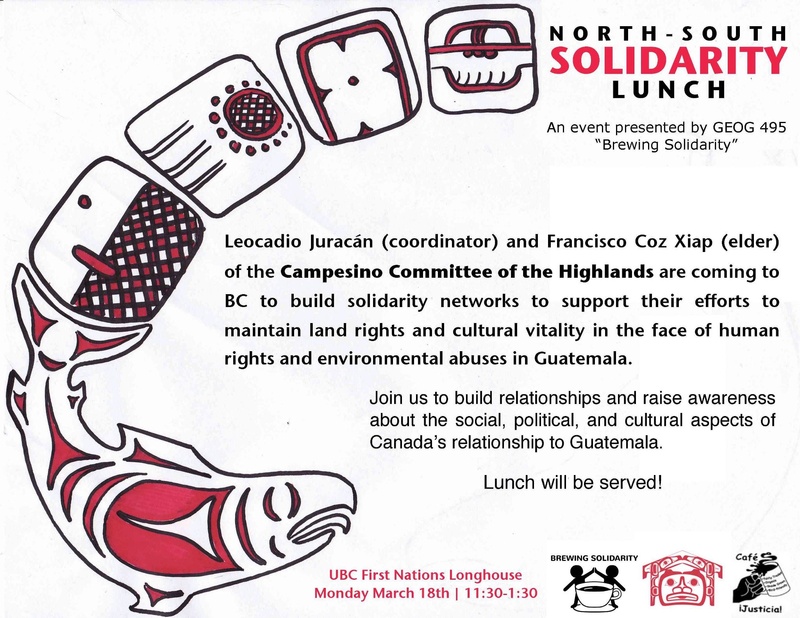 Leocadio Juracán (coordinator) and Francisco Coz Xiap (elder) of the Campesino Committee of the Highlands are coming to British Columbia to build solidarity networks to support their efforts to maintain land rights and cultural vitality in the face of human rights and environmental abuses in Guatemala. GEOG 495 is supporting the CCDA’s visit in collaboration with BC CASA, a BC-based solidarity organization. To this end, we are organizing a talk (with lunch provided) at the First Nations Longhouse on March 18th, open to the general public from 11:30am-1:00pm. Our goal is to create a space for networking and relationship building, while raising awareness about the social, political, and cultural aspects of Canada’s relationship to Guatemala. We would be thrilled if you could make it to our event to connect with the CCDA and strengthen North-South solidarity networks. Please RSVP (preferably before Friday, March 15th, 11:59PM) so that we can prepare enough food for everyone. Tickets are $10 ($5 go to our solidarity efforts) and include a beginner salsa class 9:15-10pm and a night of dancing! Additionally, the students of 495 will be selling raffle tickets throughout the night and there are some great prizes! Tickets are for sale in the Geography building. Please leave us a message on our site, which also provides more information on our Community Service Learning project.